I didn't love A Tale of Two Cities. Or should I say I didn't love it as much as I hoped I would OR even thought I would. A Tale of Two Cities is definitely a subject-driven novel. The focus, I would even say sole focus, is on the French Revolution. 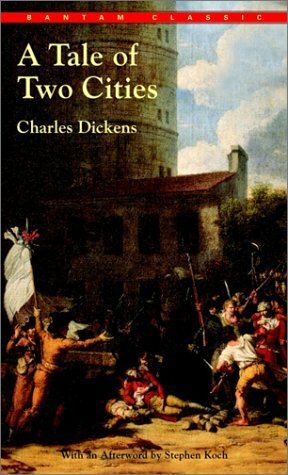 We meet individual characters within that setting, to make the French Revolution more personal, perhaps, but, in my opinion, Dickens characterization is not as strong in A Tale of Two Cities as it is in some of his other novels. That doesn't mean his characters are not memorable. In fact, I imagine that there are at least two or three characters in this one that are very memorable indeed. A Tale of Two Cities is also a very heavy novel thematically. It's just dark and oppressive. Dickens won't be bringing any smiles to readers in this one. Personally, I love it when Dickens makes me laugh! The novel begins with a reunion. A daughter, Lucie Manette, learns that the father she has long presumed to be dead is, in fact, alive. His existence seems to be news to quite a few people. Lucie Manette and Mr. Jarvis Lorry travel to France from England to meet him and bring him back. The name of this section is "Recalled to Life." And it's a very fitting title, in my opinion. Lorry and Lucie never really learn the whole story, all the ugly details of the past. Seeing Lucie with her father reminded me--in a good way--of the relationship between Jean Valjean and Cosette. The second book, "The Golden Thread," introduces readers to Charles Darnay and Sydney Carton. These two men become very well known to Dr. Manette and his daughter. Both men love and admire her, as you would expect. But she can only love one of them, and, her heart belongs to Charles. Of course, this is a very simple summary! The third book is "The Track of A Storm." Let's just say, Dickens can do bleakity-bleak. This book follows Charles Darnay into France during the early days of the French Revolution. I had a hard time reading this section, because I didn't want to experience it. Darnay is NOT alone in France. And he's far from forgotten. Dr. Manette and his daughter and granddaughter are there, for one, and so is Sydney Carton. Of course, there are others as well to round out the plot. Throughout all three sections, readers have also followed a few people from France, mainly Monsieur Defarge and his not-so-lovely wife, Madame Defarge. I'm not sure I've ever hated a character more. I am sure that I have. Probably. Still, this book made me so very angry in places!!! I won't talk about the ending. I won't. I don't want to. I probably don't even need to. A Tale of Two Cities left me needing a comfort read as a follow-up.